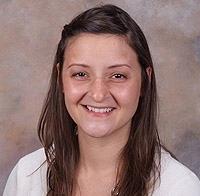 Eau Claire resident Michelle Clark-Forsting, MD, MPH, is one of 20 family medicine residents nationwide to receive the 2014 AAFP Award for Excellence in Graduate Medical Education. Eau Claire resident Michelle Clark-Forsting, MD, MPH, was selected to receive the prestigious 2014 American Academy of Family Physicians (AAFP) Award for Excellence in Graduate Medical Education. This award recognizes outstanding family medicine residents for their leadership, civic involvement, exemplary patient care and aptitude for and interest in family medicine. Only 20 are awarded annually in the entire nation. Dr. Clark-Forsting will attend a recognition breakfast on Friday, October 24, 2014, during the AAFP Annual Assembly in Washington, DC. Dr. Clark-Forsting has been involved in many community initiatives throughout her years of education. For example, she developed the Hospice Teen Volunteer Program at the Black River Memorial Hospital (BRMH) while a student in the Master of Public Health program at UW-La Crosse. That program aimed to engage teens in their communities while they learned about the healthcare field. It has led to ongoing teen volunteerism at BRMH. According to Dr. Clark-Forsting, physicians have the unique opportunity to be both medical and community leaders. She states that the physicians in her community had a very positive impact on her as she was working through high school as a nursing assistant; she credits their encouragement for leading to many of her accomplishments. Dr. Clark-Forsting sees patients at the UW Health Augusta Family Medicine Clinic. The care she provides is based on her personal philosophy that medicine isn’t just about medicine; it’s first and foremost about relationships. She will complete residency in August of 2015. Upon graduation, she will be joining the Krohn Clinic in Black River Falls. The AAFP Award for Excellence in Graduate Medical Education is supported by a grant from Bristol-Myers Squibb.